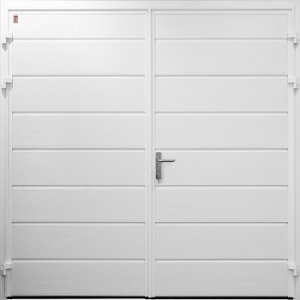 Superior quality, 40mm thick, foam-filled insulated side-hinged garage doors from Carteck and Ryterna at discounted prices. Double seals for excellent draught reduction, most styles available in 1/2-1/2 or 1/3-2/3 split. 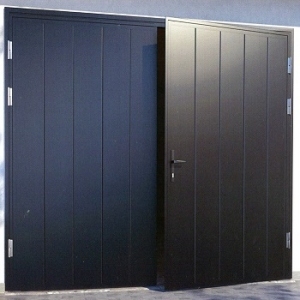 Carteck doors are made in Britain using German-made panels. Ryterna doors are made in Lithuania. 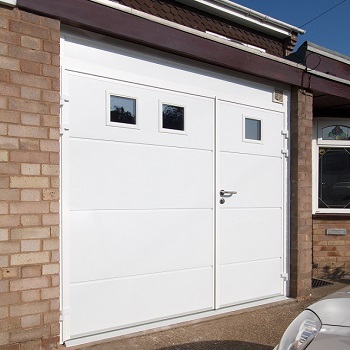 These insulated, side-hinged garage doors offer significant thermal and accoustic insulation and draught-proofing. 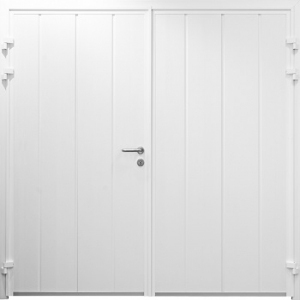 Door leaves come pre-fitted to the colour-matched frames with strong colour-matched hinges. Carteck doors come with high quality, brushed stainless steel door handles and escutcheons. 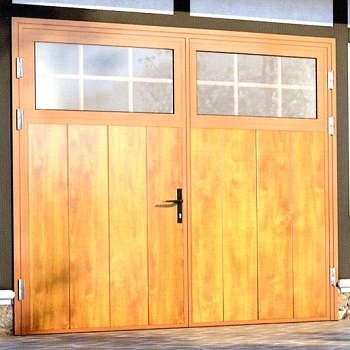 Both types of doors come with telescopic door stays and quality internal shoot bolts. 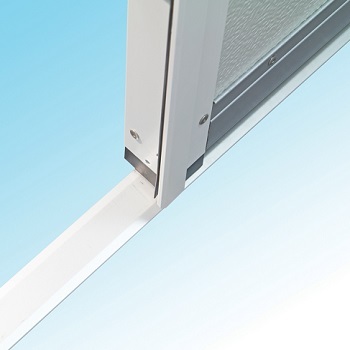 The optional raised threshold profile is a sturdy, aluminium extrusion with crushable rubber insert against which the door leaves seal. Highly recommended to maximise draught-proofing. Various horizontal and vertically ribbed designs and two Georgian designs available. The rear of the Carteck and Ryterna side-hinged door leaves are off-white, smooth and wipeable. Ideal for integral garages, home workshops, home gyms, hobby and play rooms and numerous light industrial & commercial applications. Smooth or woodgrain white, as standard. Woodgrain Golden Oak/Rosewood or any RAL colour to suit your requirements. 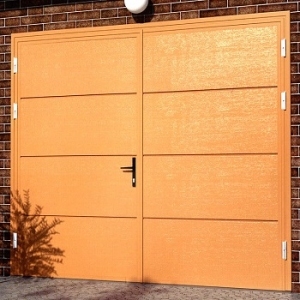 Different makes and designs of insulated steel side-hinged garage doors explained. 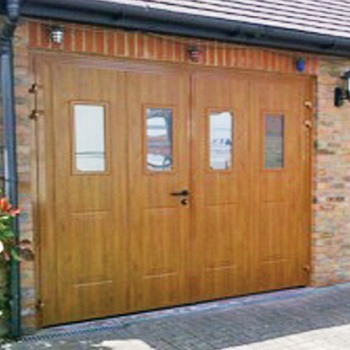 Side-hinged garage doors have long since been popular on garages used as workshops, utility rooms, home offices, home gyms, playrooms and on the odd occasion to take a car! 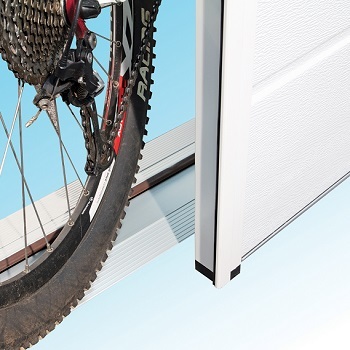 The conveniences of easy pedestrian access, privacy and space maximization inside the garage have been added to by Carteck in their insulated side hung door developed specially for the UK market. Carteck Teckentrupp Germany make twin-walled, steel, 40mm thick insulated panels which form the basis for the product. These Carteck Horizontal Solid Smooth insulated side-hinged garage doors in Anthracite Grey shown on the picture, which Carteck use on the front of their brochure, were supplied by Arridge Garage Doors Ltd and installed by Ryan, our Midlands-based fitter. 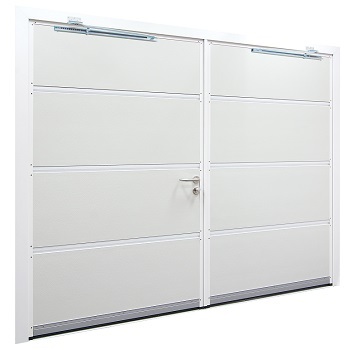 Carteck GSW 40-L insulated side hinged doors. Numerous options on size, design, finish, colour and windows. Brown Horizontal Solid Smooth 50:50 split. White Horizontal Solid Smooth 1/3 : 2/3 split. Green Standard Vertical Rib 50 : 50 split with White Frame. Matching Side Door with Stainless Steel Porthole Window. 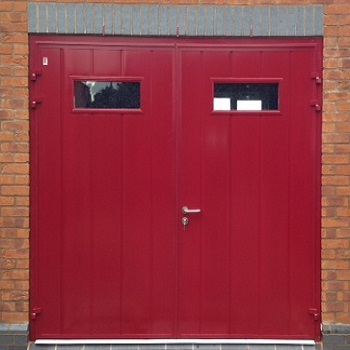 Red Standard Vertical Rib Woodgrain with Rectangle Type 1 Windows. Golden Oak Vertical Georgian with Windows. 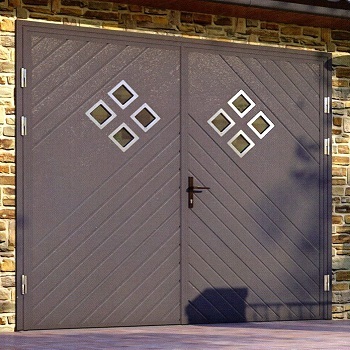 Horizontal or vertical designs available in Georgian, Standard Rib, Centre Rib or Solid Smooth design and a choice of Smooth, Woodgrain or Stucco finish. All doors are made-to-measure at no extra cost. White, Golden Oak, Rosewood, dark Oak or a choice of 16 standard Trend colours. Any RAL or BS colour on request. Widths available upto 2500mm wide including frame and heights upto 2359mm. Numerous window types available including round and square porthole windows positioned within the door leaves to suit your specification. Carteck Trend RAL colour chart. Horizontal Georgian doors with the Georgian features in “landscape” orientation have 2 columns of panels. Widths of 2350mm and over have 3 columns and are asymmetrical as shown. Vertical Georgian doors have 2 rows of features, as standard. Only on doors of 2200mm high and above have 3 rows of features. This height increases to 2250mm for doors with windows. Minimum width Georgian single leaf 850mm, double leaf 1350mm. N.B. 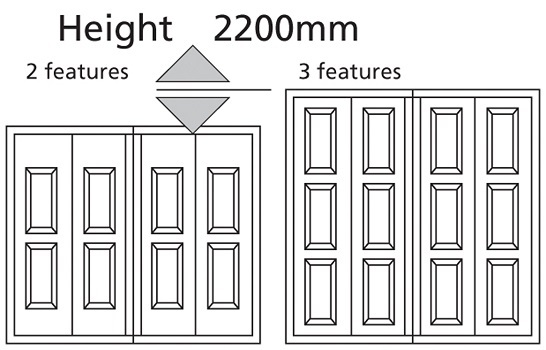 if considering off centre split doors, maximum possible leaf size is 1300mm. If a greater width is required, please see the Ryterna Insulated Side-Hinged doors, in which this is possible. Carteck Horizontal Georgian doors with the Georgian features in “landscape” orientation. Carteck Vertical Georgian doors have 2 rows of features, as standard. The Carteck panels are assembled into a perimeter frame to form the door leaves and these are hung on a matching box section aluminium goalpost. 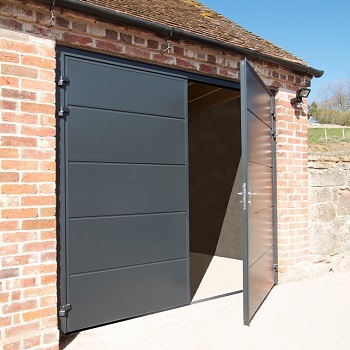 Much increased strength, heat retention and noise reduction compared to standard side-hung garage doors, all round rubber seals, stainless steel handles, security locking and telescopic door stays make these doors an excellent choice. The back of the doors is always in RAL 9002 grey stucco finish. It is light, but serviceable, easy to wipe clean with no ugly bracings on the back. Outside view of Carteck side-hinged door. Standard features included with Carteck GSW 40-L insulated side hinged doors at no extra cost. 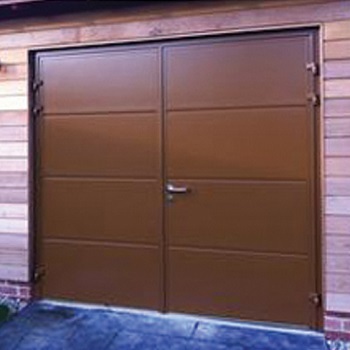 All Carteck insulated side-hinged doors come with a colour matched frame. N.B. 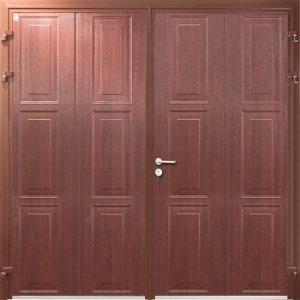 Wood laminate finish doors come with complimentary flat colour frame, not foiled woodgrain: Golden Oak RAL 8003; Rosewood RAL 8016; Dark Oak RAL 8014; Winchester Oak RAL 8001. 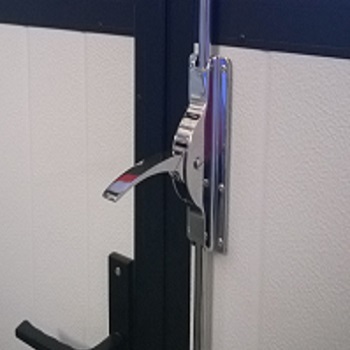 Extra neat, spring dampened door stays hold the doors in the 90° open position. They prevent wind slam or wind flinging the doors back on themselves. Standard brushed aluminium threshold braces the frame legs at the bottom and give the door seals along the bottom edge of each leaf something to seal against. Attractive, high quality, brushed stainless steel handle and Eurolock escutcheon. Double throw sash mortice lock and secure centre cover strip on the active leaf ensure a high level of security. Depending on door size, 2 or 3 colour matched aluminium hinges are fitted per door leaf. 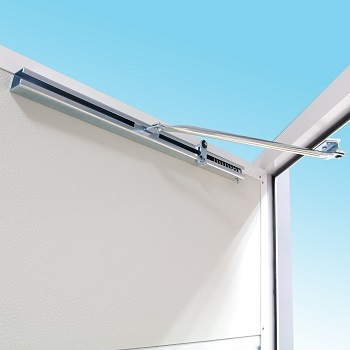 These hinges are adjustable, enabling easy on-site fine adjustment of the doors. 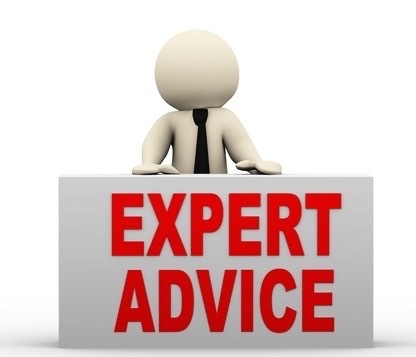 Quality weather strips on all four edges of the door and on the three sided door frame greatly increase draught sealing and weather proofing. Sturdy shoot bolts top and bottom of the fixed leaf are neatly set into the door edge, giving a very neat internal appearance. Optional extras for Carteck GSW 40-L insulated side hinged doors are available at additional cost. Triple point locking and a heavy duty aluminium threshold with inbuilt seal are available as optional extras for Carteck GSW 40-L doors. Triple point locking. 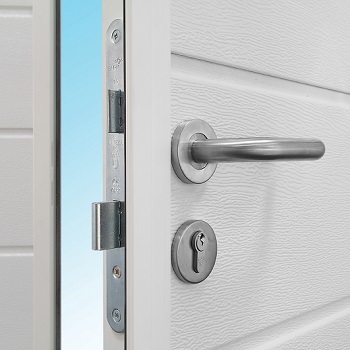 The active leaf is available with key operated 3 point locking to further increase the overall security of the door. Heavy duty aluminium threshold. 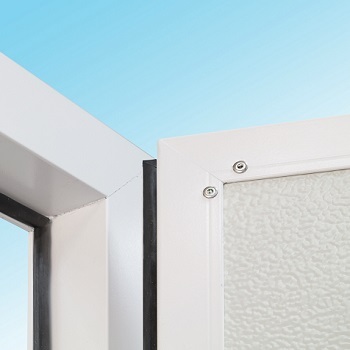 A sturdy aluminium extrusion, with a rubber lined rebate into which the door leaves close, is recommended to improve the draught, weather and debris seal along the bottom edge of the doors. A built-in thermal break in the threshold reduces thermal transfer. Can be driven over by vehicles without fear of damage. Any questions? 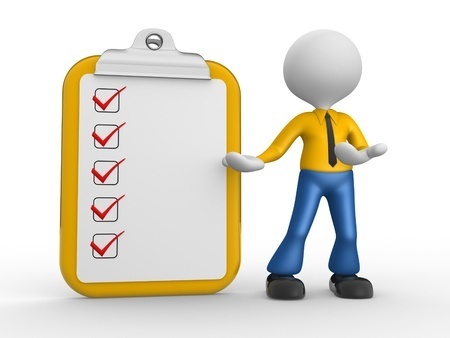 Phone us on 01691 670394 or contact us with your specific questions or requests. We look forward to hearing from you. 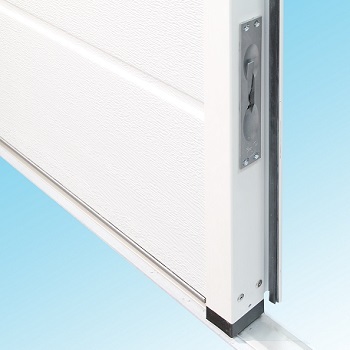 Optional heavy duty aluminium threshold with inbuilt seal for Carteck GSW 40-L insulated side hinged door. 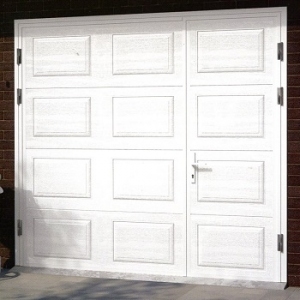 Ryterna side-hinged garage doors available made-to-measure and in standard sizes. 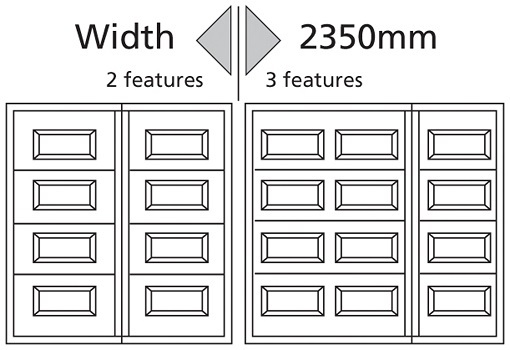 Every side-hung Ryterna door is manufactured specially to suit a customer’s sizes and specification. 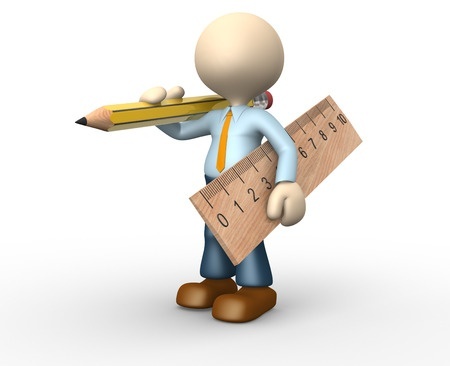 No bespoke price premiums apply and lead times are generally around 4 weeks. The two door leaves, goalpost fixing frame and inbuilt threshold are manufactured just 10mm narrower and 10mm shorter than your actual brickwork opening size. 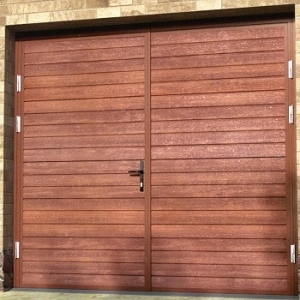 Pairs of doors available upto 3000mm wide and upto 2450mm high. 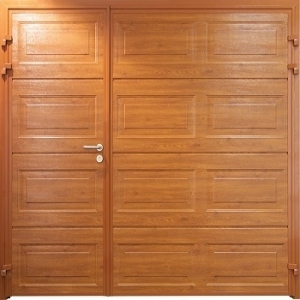 Matching single personnel doors also available. 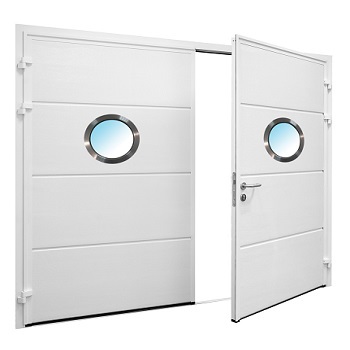 The door leaves themselves are made from twin-walled, fully finished steel with a rigid foam core 40mm thick. Rubber seals fitted around the perimeter and between the two door leaves minimise draught ingress. Many customers purchasing insulated side-hung garage doors do not park cars in the garage, so a deep threshold improving security and draught proofing is preferred. The new S5 threshold is a universal threshold 25mm tall which can be driven over. The flat threshold is a popular choice for regular car usage. Ryterna threshold options S1 and S2. Ryterna threshold options S3 and S4. 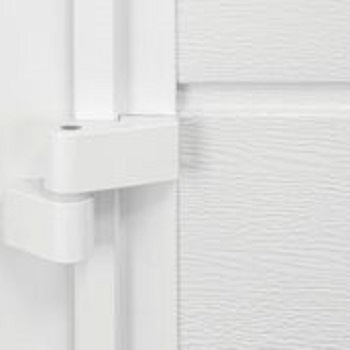 A white, black or aluminium painted handle can be specified with your order. If a handle painted to match the door colour is preferred, this can be provided at a small extra cost. The active leaf has a mortice sash lock fitted which can be locked and unlocked from inside and outside. Sturdy galvanized top and bottom shoot bolts on the fixed leaf are included. 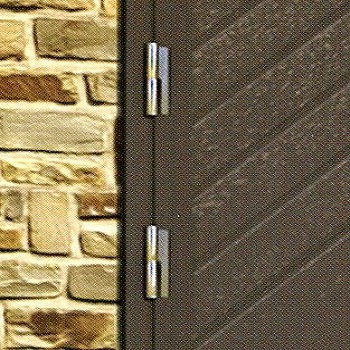 The heavy duty and very attractive stainless steel hinges are a standard feature of the Ryterna door. Chunky, good looking and rust-proof. 50/50 or Off Centre Split to your specification. Busy pedestrian use is often made easier with a 2/3 fixed door, 1/3 active door. Privacy and ease of use is maximized. Simply specify when you order. Low cost optional extras available on Ryterna side-hinged doors. The espagnolette lock is a top and bottom shoot bolt activated by a sturdy lever located on the rear of the fixed leaf at chest height. No reaching up or bending down to disengage the shoot bolts. Door stays keep the door leaves fixed in the open position. Adjustable leaf opening angle 90° - 135°. 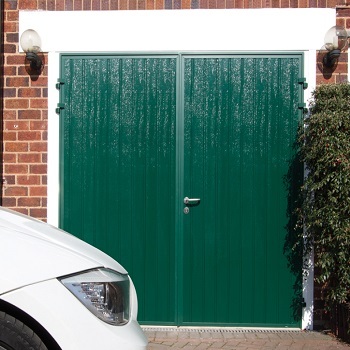 Very useful for garages which house a car to prevent door slam as you drive in and if you like to keep the garage doors safely open and damage free. The multi-point locking upgrade is a very well priced security upgrade. 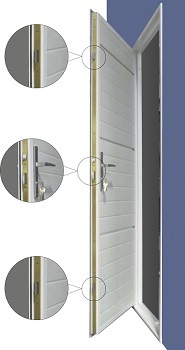 Three locks between the two leaves, similar to the locking on a upvc front door, increase the overall security level. Ryterna window and glazing options, stainless steel feature windows and appliqués. Please see the online brochure to view all glazing options available. rectangular in shape in a range of sizes. 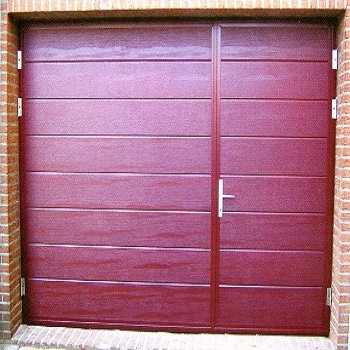 Stainless steel appliqués customise your garage door. Numerous options and bespoke patterns available at affordable prices, please click here to see our online brochure. 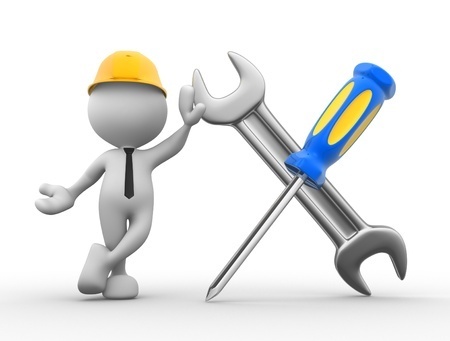 Thank you for looking at our insulated side-hung garage doors. Please phone with any questions or e-mail us your sizes and questions using our contact us form. We look forward to hearing from you.